The Public Building Commission of Chicago and the City of Chicago, working together through an intergovernmental agreement, join the Chicago Public Library in conducting a comprehensive library building program. 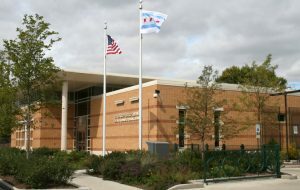 The program includes the construction or renovation of branch libraries, the building of additional new branch libraries in various parts of Chicago, and the replacement of small, store-front libraries with new, modern library facilities. The efforts of Mayor Rahm Emanuel, the PBC and the Public Library have lead to a prototype design for branch libraries, allowing them to be built efficiently and cost-effectively. The designs also provide for the thoughtful use of space, and through this the libraries are able to host a variety of offerings, such as children’s reading programs, high school equivalency and financial planning classes for adults, and various additional resources to enrich the learning process for library patrons of all ages. Further, the designs for all new libraries include features that qualify the building for certification under the U.S. Green Building Council’s Leadership in Energy and Environmental Design (LEED) standards. The result is a broad-based, technologically advanced library system that plays a vital role in the education and literacy of Chicago’s children and adults.